As Paul Reinisch's group of young players in Clifton Park, NY, got older, they kept winning, according to the Schenectady Daily Gazette's YourCliftonPark.com. Even with some turnover, the kids had taken six Eastern New York titles, Your Clifton Park wrote in July 2015, as the kids appeared in the 2015 13U Middle Atlantic Regional. "It's been a pretty good run," Reinisch told Your Clifton Park. "For young guys, they've had an incredible experience of being in close games and maintaining their composure." Reinisch worked to maintain his own composure years earlier as a player himself. After a brief run in the minors, Reinisch went on to play six seasons in independent ball, including three for his hometown Albany squad. Reinisch's career began in 1990, taken by the Tigers in the 31st round of the draft out of Wake Forest University. He went to Wake Forest out of Christian Brothers Academy outside Albany. At Wake Forest, Reinisch doubled and scored in an April 1990 game and he picked up a save in another. Taken by the Tigers, Reinisch played at rookie Bristol. He got into 15 games, all in relief. He picked up two wins, one loss and a 1.52 ERA. His ERA, however, wasn't enough for him to return. Reinisch didn't play pro ball again until 1994 at independent Marshall of the North Central League. In the meantime, he played amateur ball, hitting a two-run home run in a July 1993 game for Anaconda Sports in Albany. When he returned to the pros, also switched to the field. He played that year for Marshall mostly at third base. He hit .287 in 67 games. 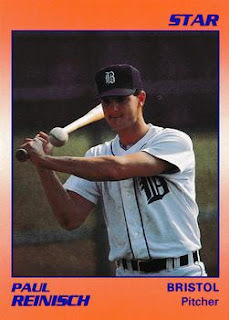 Reinisch then moved home to Albany for 1995, playing with the independent Diamond Dogs. He hit .305 that year and .360 the next. His 1996 mark for Albany won the team MVP award. He played 1997 back at Albany, also getting time at Waterbury. He then finished out his pro career at Adirondack in 1998 and Massachusetts in 1999. Reinisch has since gone on to be a youth coach in Clifton Park and school district director of athletics and physical education in nearby Troy, NY. In July 2014, his Clifton Park team won its latest Eastern New York State crown on the bat of one of his players named Sammy Marshall. Reinisch credited his players for stepping up all along the way, according to The Saratogian of Saratoga Springs. "It's been an awesome team effort," Reinisch told The Saratogian. "It just had to be Sammy today and it's been somebody else tomorrow, that's been the beauty of this line-up."